Just like human babies, kittens need delicate care and special nutrition in their first year to ensure healthy growth. -100% complete and balanced, with 41 essential nutrients. -Made in small kibbles for easy chewing. - Enriched with calcium, phosphorus, and vitamin D for healthy bones and overall growth. - Contains natural antioxidants for a healthy immune system. - Contains tasty filled milky pocket kibbles, with the goodness of milk. - Contains natural antioxidants for healthy immune system. A mother’s milk is the best thing a kitten can have. As kittens are weaned off, they need special diet to support its growth. 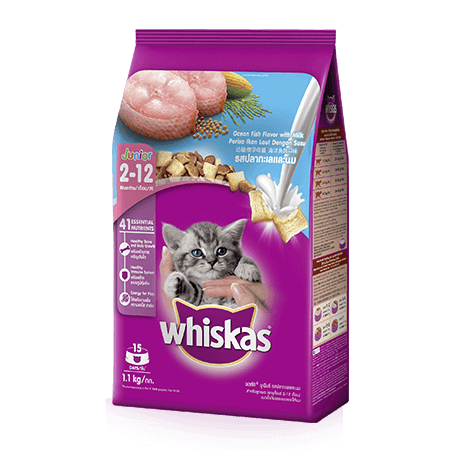 WHISKAS Junior 2-12 months pouch (wet food) is suitable as first foods for kittens to transition into. It is made with fresh, nutritious and delicious fish, and is gentle on the delicate gums and teeth of kittens that are newly formed. Dry food which are specially formulated for kittens is another suitable option. WHISKAS Junior 2-12 Months dry food is 100% complete and balanced, and is enriched with the tasty filled milky pocket kibbles that your kitten will love. It comes in small-sized kibbles for easy chewing. You can add water to the kibbles to soften its texture. Available in 450g and 1.1kg.